"We bless the (Jerusalem) operation. It will not be the last," Hamas said in a statement following the terrorist attack at Mercaz HaRav, a Jewish yeshiva in Western Jerusalem, as candy was handed out in celebration in the Gaza Strip. 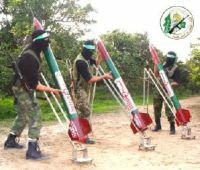 Just three days earlier, a Reuters headline on an article presenting Hamas terrorists as heroic warriors trumpeted, "Inspired by God, Hamas Fighters Battle On."